Found 12359 Beds Cat Products. Give your pets the pampering they deserve with these two cozy and comfy bedding mats. With two sizes in each package, you can put one in a pet bed and one on the floor, or one on your pet's favorite hanging-out spots in two rooms, and so on. Great for cats, puppies, small to medium dogs, and other similar-sized pets. All pets love having a warm and cozy place to curl up, and these mats fit the bill. The special properties of these mats absorb, hold, and reflect pet's natural body heat, while also insulating them from cold floors. The velvety top covering is super-comfortable, and far easier to remove pet hair from than the shaggy surface of other pet beds. (If washing should be required, we recommend hand-washing and line drying.) Give your pets a special, easy-to-clean place to call their own, and they'll spend less time shedding on your furniture -- a win for everybody. Original Kitty Cot (Large) - measures 25-1/2″ wide (from outside to outside of suction cups) x 14″ deep. The Kitty Cot is a great design that's sure to thrill your Kitty Cat. Unlike most cat beds and cat perches, Kitty Cots attach to glass windows using PATENTED Giant Suction Cups, made in the USA. They really are amazing! Each suction cup is rated to hold 12 pounds therefore we can safely say it will hold up to 25 lbs. of Kittycat(s). Kitty Cots come in 3 sizes to fit various size window widths and preferences, Small, Medium and Large. Large Kitty Cots measure 25-1/2″ wide (from outside to outside of suction cups) x 14″ deep. Medium Kitty Cots measure 22-1/2″ wide (from outside to outside of suction cups) x 14″ deep. Small Kitty Cots measure 19-1/2″ wide (from outside to outside of suction cups) x 14″ deep. The Kitty Cot frame is made of strong and durable plastic pipe. The hammock is made of tough weather-resistant fabric, an "easy clean" comfy material that your cats will love. Quickly take the Kitty Cot down for easy cleaning. The Kitty Cot can go on a glass window or even mirror anywhere in your house and at any height. Kitty Cots work indoors and outdoors. Our design is so simple and easy that anyone can put it up and best of all, you need no tools to install it. Lay your cat's favorite blanket down to make it even more bed-like and comfortable. Install next to an outside bird feeder or other action locations and your cat will be entertained for hours lying in a sunny place in their cozy cat bed. The mental stimulation of your cat will keep him or her young and active for years. Great for older cats! Kittens are a hoot! They will dream of capturing the world! The fabric is a tough plastic coated nylon mesh commonly used in outdoor furniture. We use muti-color and solid colors. It always varies a little bit purrfectly! 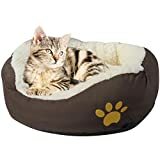 Plush Pet Bed | Ombré Swirl Dog Bed & Cat Bed | Gray 17L x 11W x 1. 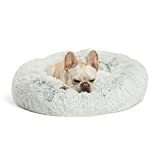 If you want to spoil your best friend (whether they be a dog or a cat...), the plush, tufted and over-stuffed QuiteTime Deluxe Ombré Swirl Pet Bed by MidWest Homes for Pets is the perfect pet bed for you! Each pet bed is available in multiple sizes that are perfectly suited for almost any breed of dog or cat. These neutral color (mocha or gray) dog / cat beds will complement any home décor and provide your pet a cozy place to rest. All Ombré Swirl pet beds feature a “no-slip” surface on the bottom that’s perfect for hardwood or tile floors. They are machine washable and dryer safe, and they are sized to fit inside most standard dog crates creating a comfortable and desired location for your dog or cat to relax. Please note that the Quiet Time Ombre Swirl pet bed is not ideal for excessive “chewers” or dogs with high separation anxiety. If your dog is an excessive chewer, we suggest keeping a chew toy with your pet when in the crate in hopes your dog will chew the toy and not the pet bed. MidWest Homes for Pets stands behind the quality of our products with a 1-Year Manufacturer’s Warranty. If you have any questions regarding our dog beds or cat beds our customer service department would be glad to help you. MidWest customer service can be contacted at: 1-800-428-8560, available 9:00 AM – 4:00 PM, Monday – Friday EST. 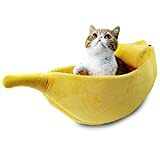 Adorable Banana Pet Cat Bed House, Semi-open Lid Kittens Bed for Small Pets In the summer, the air conditioner is low, the cat is easy to catch cold; the winter weather is cold, cat shrinks into a ball; long-term contact the floor, the cat's stomach and bone is not good.That's OK. We can solve all of the above problems. Wow! Look so sweet and cute! Do you want to eat the banana? Banana bed is made of cotton, PP and coral fleece. The whole house is so soft and comfortable, not easy to lose the hair, not the ball and not fade. Your pet like it so much and have a good sleep.The bad have a door! The tail of the nest has velcro design, which can be stuck to the head of banana skin to keep the door open so that the pet can come in and out. FEATURES1.Made of cloth feels very smooth, super soft plush and PP cotton filling, cozy, give your love pets a warm bed. 2. Lovely yellow Banana designed, It's not just a cat's bedding house, also decorated your home.A Banana was placed in the house, make the room lively and bright. 3. Semi-open Lid designed, give your pet a private and cozy place. 4. SMALL MEDIUM LARGE EXTRA LARGE sizes can be selected, choose one for your pet and give it a wonderful bed. 5. Provide a soft and cozy place for your pet to rest and relax. SIZE & WEIGHT Size S: 15.8"*5.9"*3.9", Perfect for cats/kittens and other pets within 3.3 lb. 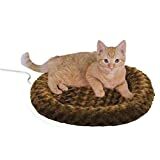 Size M: 21.7"*7.9"*5.9", Perfect for cats/kittens and other pets within 6.6 lb. Size L: 25.9"*9.8"*7.1", Perfect for cats/kittens and other pets within 11 lb. Size XL: 35.4"*11.8"*7.9", Perfect for cats/kittens and other pets within 22 lb. IMPORTANT NOTICE1. Please measure your pet's weight before you purchasing to make sure you can get the suitable size.2.Size is for reference only, an allowable discrepancy (1 inch) exits depending on your manual measurement. 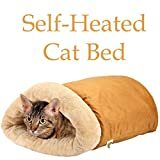 The K&H Thermo-Kitty Mat is an affordable heated sleeping mat with a dual thermostat heater buried beneath soft foam to make a comfortable napping place for cats. The surface temperature of the K&H Thermo-Kitty Mat will remain 10-15 degrees above ambient air temperature when not in use by the pet. The product is designed such that the surface will only warm to full temperature when the pet is on the mat. As a simple test, you may place a pillow on top of the K&H Thermo-Kitty Mat - after about 15 minutes the under-side of the pillow should feel warm, but not hot. This is the warmth that your pet will feel when lying on the K&H Thermo-Kitty Mat. Some cool cats are just to hip for a regular bed. That’s why we introduced the new Thermo-Kitty Fashion Splash! With 3 happening colors and our incredibly energy efficient 4 watt heater, this bed is sure to please. It’s the hottest thing going! Fashion Splash is washable and MET Listed. SOPHISTICATED DESIGN MEETS UNPARALLELED COMFORT!Whether they’re curling up for the night or they’re just taking their afternoon nap, most pets will sleep just about anywhere. But cold, hard floors make it difficult to get comfortable, diminishing sleep quality and worsening joint pain, leading to less than optimal health and behavior.Give your furry friend the gift of comfort with a Shag Donut Cuddler from Best Friends by Sheri! Our beds feature a round design, creating a cozy, protective atmosphere. Pets will feel surrounded by love and warmth, allowing them to experience truly restful sleep. The bolstered edge also acts as a head rest, offering additional orthopedic support.For an extra layer of comfort and luxury, our beds feature a faux shag fur! Not only does it help keep animals cozy on cold nights, but our extra filling also provides relief from joint and muscle pain. Finished with deep crevices that are perfect for burrowing, dogs and cats alike will love the versatility of these beds. The best part? They’re safe in the washer and dryer!Made with pet-safe faux fur and water-resistant nylon, our beds deliver superior comfort while acting as the first line of defense against accidents. Available in stunningly beautiful colors, they’re a great choice for both your pet and your home.WHY CHOOSE THE SHAG DONUT CUDDLER ? Orthopedic and joint supportProvides warmth and safetyWater-resistant bottomSafe in the washer and dryerMade with pet-safe materialsTry Today Risk Free with Our Money Back Guarantee! *Stock is limited. Order today to ensure availability.Order Your Pet Bed Now for Deep, Peaceful Sleep!Check out our matching Shag Throw Blanket and Throw Pillows from our sister brand Chateau by Sheri. Cats' tastes and preferences are always changing. Their favorite food of today may not be worth even a sniff tomorrow. And when it comes to their favorite place to sleep and hang out, most cats like to change things up there, too. Sometimes they want a place where they can curl up tight, other times they want to stretch out flat. Sometimes they want to be out in the open, other times they want to hide out of sight. With the Pet Magasin Cat Cave, you can accommodate all these different kitty-preferences. As the name suggests, the Cat Cave can be used as a cave that a cat can hide in (maybe playing "ambush" with another cat or with your feet when you walk by). And it can also be used as a flat bed, or set up on either end and used as a cozy circular curling-up bed. And for softness and comfort, even the most finicky cat will have nothing but love for this bed. The synthetic fur and microfiber fabric outer layers covering fleece and foam stuffing make the Cat Cave as comfortable as can be. Order your Cat Cave today and get the kitty bed that's almost as changeable as your kitty's personality! Care instructions: If your Cat Cave needs laundering, we recommend hand washing and tumble drying. Pet Magasin is a company committed to manufacturing top-quality products for your pets.